It sounds like a broken record, but we had another tough day of cycling on the gravel road. It seems like they dumped a fresh load of gravel on this road. This accompanied with climbs made for a slow ride. Even the downhills were slow since we had to be careful to avoid sliding. It was foggy when we left. We all left close to the same time. I cleared my glasses a few times due to the mist. At 9km, the fog began to lift and we briefly saw a rainbow. At 18km we reached the first top of the hill. We had a steep descent and then followed a stream downhill. We started the next climb around 27km and reached another top at 32km. From here a descent to 44km. 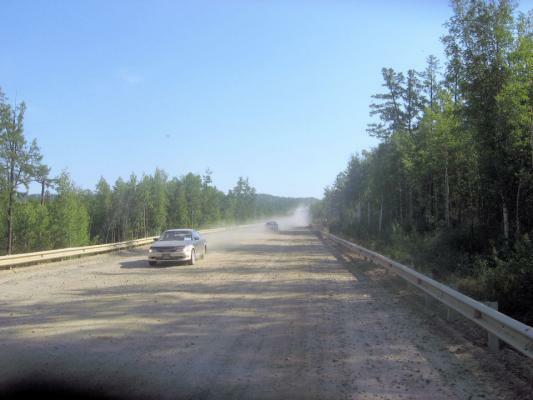 By now there were many cars raising dust. 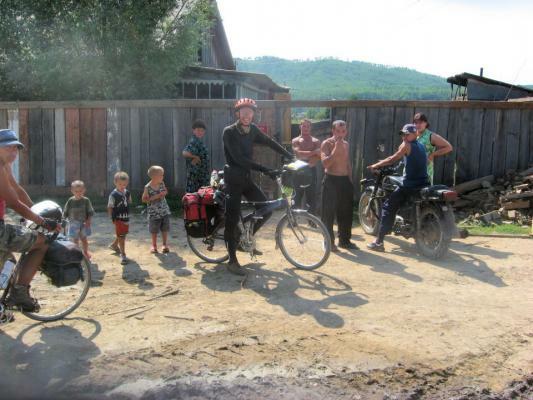 It was getting hot again as we had more climbs and descents before reaching a cafe at Сбега turnoff at 56km. After a filling lunch, we headed into town. We decided to take the old road from here to Могоча rather than the new one. This was in part because we were told ~150km of road without cafe and wanted to try something different than our dusty road. We’ll see how that part of the adventure goes. First we rode around town to find a store, refilled on provisions and water. Bert discovered two more screws missing from his bike. I discovered that my front cycling rack had broken. This is likely the same problem that Herman Veldhuizen had with the same rack. I used the same remedy of shifting the rack further forward.